Editor’s Note: Duane Stoltzfus’ Writing for Media class attended a Goshen City Council meeting Nov. 20. The assignment called for reporting on the event with a midnight deadline. The class voted on the top four articles, which were then submitted for print. The Goshen City Council voted 5-2 on Tuesday, Nov. 20 to pass an amended proposition for the $87 million expansion of Goshen Hospital. The amendment, which calls for reducing the geographic footprint of the hospital’s original plan, was proposed by councilman Adam Scharf and was the center of the discussion. Mayor Jeremy Stutsman also proposed a plan for city and hospital officials to work together to make a parking garage a financially feasible option. Councilwoman Julia King and Councilwoman Julia Gautsche offered an amendment to the amendment, removing the proposed parking lot to the south of Westwood Road. The council voted this down two different times, both failing 4-3. The council voted to table the original ordinance in the Oct. 30 council meeting, delaying the addition of a four-story tower — which will add 106 single-occupancy rooms — and a parking lot expansion. This pause gave the hospital, the affected neighborhood and city officials a chance to discuss the issue and look into various options. Representatives from the neighborhood and Goshen Health were given time to speak. Randy Christophel, President and CEO of Goshen Health and Goshen Hospital, says this project is critical to the health of patients and organization for the next decades to come, and expressed frustration that it has been delayed so long. 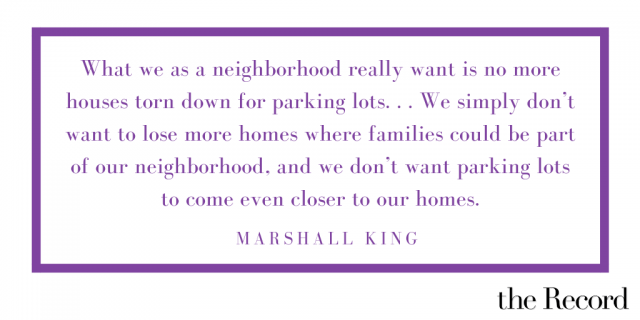 Marshall King, president of the Historic Racemere Peninsula Neighborhood Association, shared that much of the hospital’s plan, including the tower, had “overwhelming” support from the neighborhood. However, this expansion has been highly contested by homeowners, as the proposed parking lot would require the demolition of several houses. Homeowners living south of the hospital on Woodward Place expressed concern toward the light pollution and increased traffic congestion that would come with an added parking lot. One solution that came from community members was building a multi-story parking garage, something the hospital has deemed to be too expensive. Regardless, the hospital insists that current parking lots are not sufficient. With their setup, many employees are forced to park east of State Road 15 and crossing this road to get to the hospital has proven to be a safety concern. Several hospital employees shared stories of having to cross the four lanes of traffic and called for an expanded parking lot to combat this problem. Lynette Stark, a Dunlap resident who commutes to Goshen Hospital, was almost hit by a car while trying to get to work on an icy morning. Emotionally rattled, it affected her ability to do her job. “We can’t take care of our patients if we are injured,” Stark said. Several people pointed out similarities between the Tuesday night discussion and one that happened when the hospital wanted to expand and rezone into its current footprint a decade ago, including Councilwoman Gautsche who was on the council during those conversations. In addition to the hospital zoning ordinance, an annexation agreement with Goshen Community schools, two ordinances vacating public ways within the city and a transfer of funds were also approved.